This Valentine’s Day give in to your wanderlust and explore the mighty wonders of the Galapagos Islands. With their rugged landscapes, turquoise waters, and quirky wildlife, Galapagos represents an ideal setting to fan the flames of romance. Whether you’re travelling as a couple, group of friends, or alone (after all, if you can’t love yourself, how can you love somebody else? ), the Enchanted Isles are certain to delight your senses with their unparalleled beauty and plethora of activities. When it comes to visiting the Galapagos Islands, there are a range of options available for you to choose from. You might choose to traverse the islands in one of the many cruise ships, where you’ll enjoy gorgeous sunsets and exquisite cuisines, all while sampling the wide variety of land and water activities on offer; or, perhaps, you’ll decide on one of the islands’ fantastic hotels, where you’ll be just seconds away from stunning white-sand beaches. Pamper yourself and explore this exquisite paradise with your loved ones! Seize the day and book now! There’s an endless list of romantic getaways on offer during the Valentine’s Day season, but few offer the privileged vistas and luxurious comforts of a Galapagos Islands Cruise. Sail away one one of our exclusive yachts (La Pinta is one of our most popular choices) and experience a trip of a lifetime; go kayaking through cavernous volcanic landscapes, plunge into the crystalline depths to discover the bountiful sea life, or just relax with your loved one in front of an inimitable sunset view. This is a romantic getaway you’ll remember for decades to come! Seasickness need not threaten your Valentine’s Day plans! The Galapagos Islands provide an ample offer of accommodations, the mainstay of which is the legendary Finch Bay Hotel. Nestled right next to a gorgeous beach in Puerta Ayora, Finch Bay offers an amazing offer of activities; enjoy chef Byron Rivera’s culinary masterpieces, explore some of the gorgeous sights, enjoy a breezy afternoon by the pool, or discover unique vistas in one of the many kayaks at your disposal. The majestic sceneries of the islands will provide an ideal accompaniment for your romantic escapade, no matter where you choose to go. Although the Galapagos Islands are not generally considered a hotbed for gastronomic exploration, they do offer an abundant supply of remarkable chefs. Whether you decide to sail away on a cruise ship or settle in one of the islands’ many hotels, you’re sure to encounter a wide range of cuisines prepared with organic ingredients, all prepared with a distinctly Ecuadorian flair. And let’s not forget – if spending your time at Finch Bay, tempt your tongue with unique, luscious flavors at an exclusive Valentine’s Day dinner. The Galapagos Islands are a thriving paradise, replete with activities for all kinds of visitors. If you seek adventure, we recommend that you take to the trails, where you’ll marvel at the spectacular landscapes and iconic wildlife. If a romantic evening with your partner seems more suitable, enjoy a relaxing couple’s massage or a leisurely stroll at the beach. Or, if adventures seem most tempting, scuba dive in thriving water ecosystems or bike around specifically-designed cycling trails. No matter what you’re looking for – the Galapagos has it! 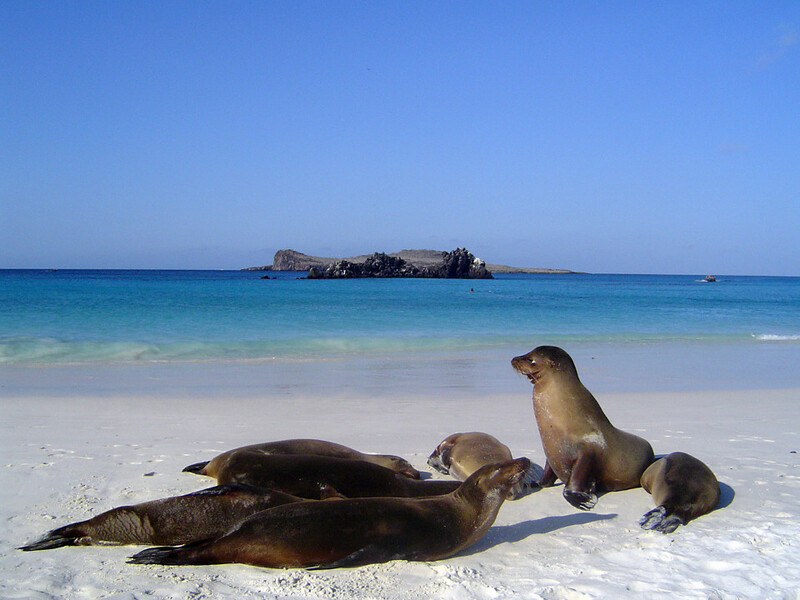 Love life at the Galapagos Islands with Metropolitan Touring.